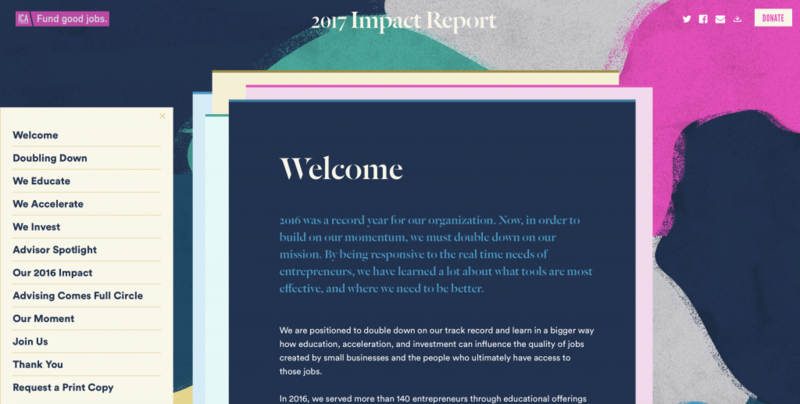 An annual report is like a slick Apple ad: it tells a story that resonates with people emotionally to confirm their support of your organization or move them to support your organization. While your IRS form 990 and annual financial disclosures tell financial facts, your annual report should paint a picture of support. It should simultaneously showcase the value of your donors and tell a compelling story of your reason for being. All in a neat, colorful package. Is your annual report accomplishing this? If not, learn 7 secrets to creating an irresistible annual report that will make your existing donors know they made the right decision to support you and potential donors want to flock to your side. Who is the persona for your annual report? Yes, there are a variety of audiences who will use your annual report, but who are you creating the piece for? If it’s not the donor, you’re making a mistake. The annual report should tell an emotionally connecting story that deepens your relationship with current and potential donors. How do we accomplish this? The simplistic answer is you need to position things using the words “you” and “your” in the copy. Your support allowed us to enter five new communities this year … You built a well that serves 500 families … Because of people like you, our building campaign met 100% funding one month ahead of schedule! But why does the annual report need to speak in the voice of our donor? What about the great work WE did this year? You aren’t able to do any work without the donor. The donor needs to feel that you’re the conduit by which she can get the work she’s passionate about accomplished. If she feels like you don’t need her, that you can get it all done yourself without her help, she’ll quit giving and give to an organization that does need her support. Using language such as “With your support” and “Thank you for doing your part” in the copy reinforces that the organization needs you, the donor, to be successful. 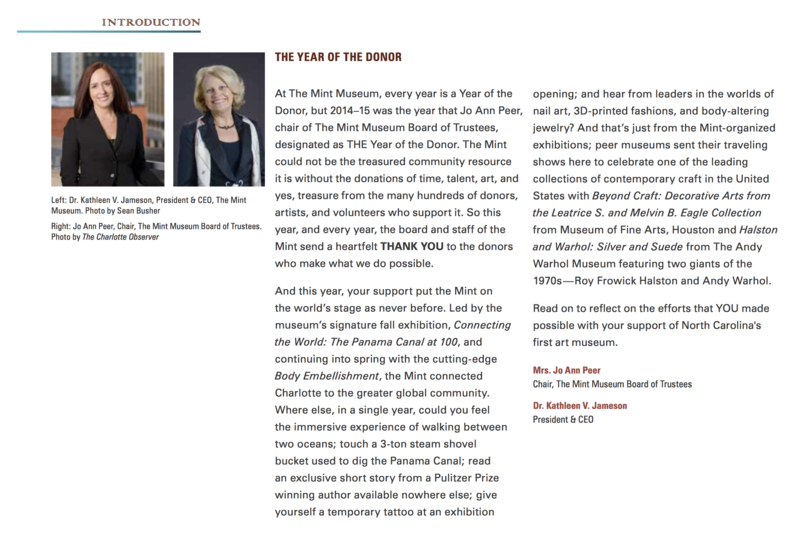 In the Mint Musem’s annual report, 2014-2015 was declared the “year of the donor.” Throughout the annual report, The Mint Museum talked about different constituents and the impact they have on the museum. This secret is a not-so-secret secret as it seems to appear every year on everyone’s “top secrets to a great nonprofit annual report” blog posts, yet it still escapes too many organizations. Studies show you have about 3 seconds to grab someone’s attention and about 8 seconds to keep it. What’s going to be the driving force in someone’s decision to give your annual report a chance? If you visually appeal to the reader in those 8 seconds. 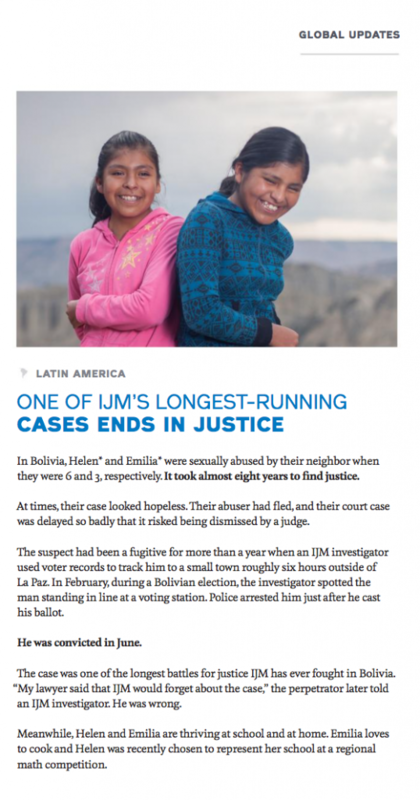 IJM does an excellent job appealing visually to the reader. 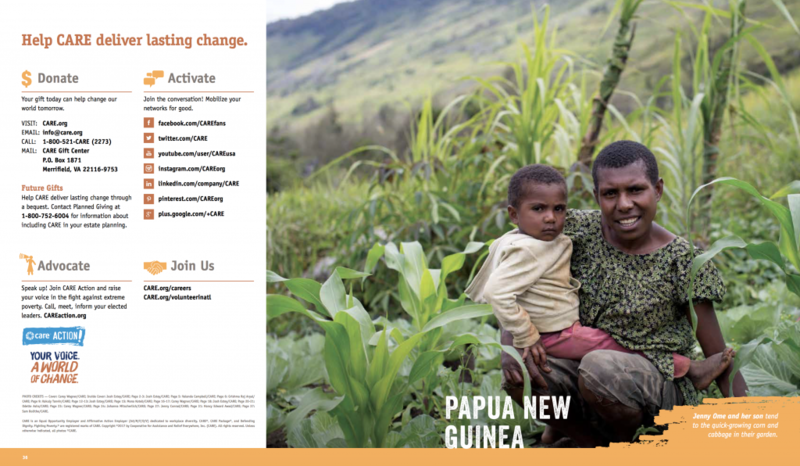 The organization uses high quality, emotional pictures throughout the annual report that tell a story. 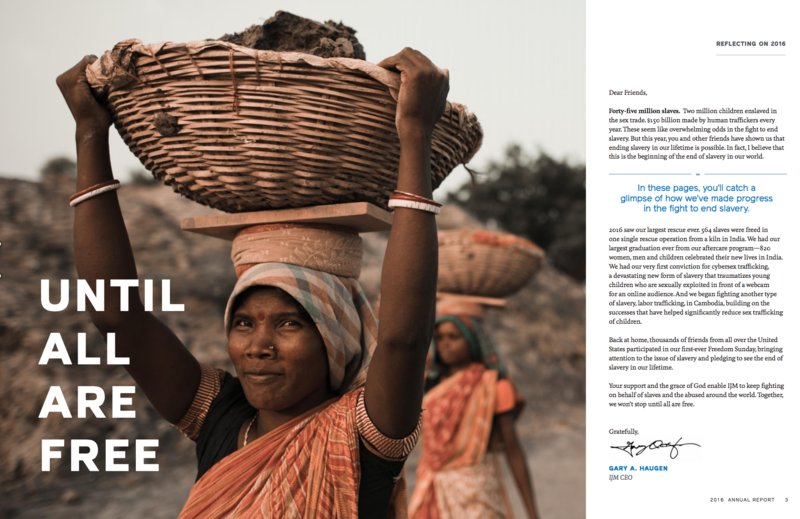 You can flip through the IJM annual report, not read one word and still understand the story of what the organization is about. It’s very deliberate on their part to appeal to a wide range of readers – text heavy stories combined with highly attractive photos. The lesson: use high quality photos for those who just want a visual glance at your organization combined with excellent story telling to really engage the widest audience. Tell the story of your metrics and key financials using graphics. Reading tables and long explanations of financials will bore your audience, so liven it up a little with great graphics. 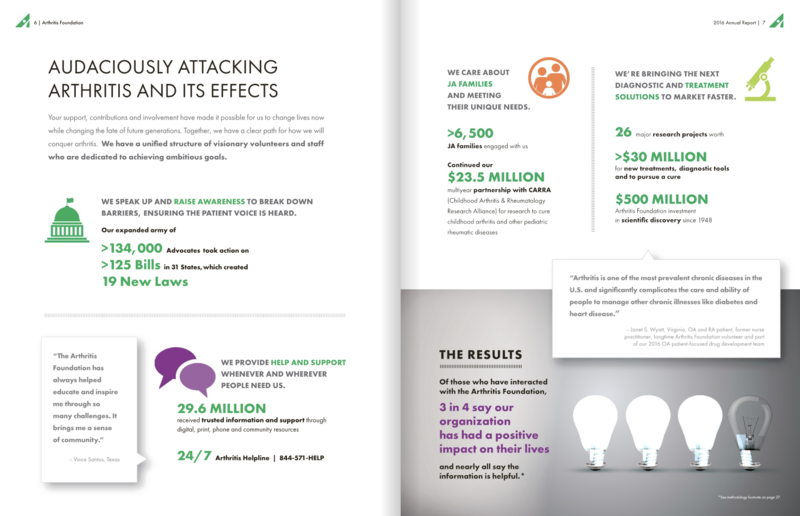 The Arthritis Foundation uses infographics and explanation bubbles throughout the annual report to illustrate their key metrics and accomplishments. Many organizations have moved their annual report to digital only (or digital + a small print run) to take advantage of the reduced costs of distribution, yet haven’t taken advantage of digital capabilities. Digital offers us animation, videos, links, and embedded social. Most of the annual reports I reviewed for this blog posts were PDFs or flip books (a lot of organizations use ISUU for flip book tech) with very few organizations taking advantage of even something simple like embedding a video. Creating a digital annual report gives us expanded opportunities, use them! Girls, Inc. uses video, animated GIFs, and web animation to create an appealing annual report. Designing each section so it draws the reader down the page helps fulfill the mission of the annual report: telling your story to donors to reinforce why they gave and explaining your mission to potential donors. ICA’s use of a table of contents and faux pages helps readers navigate the annual report and keep each page clean. The most impactful annual reports don’t tell the organization’s story, they tell the stories of all of the stakeholders: the beneficiaries, the staff, and the supporters. Instead of a dry recitation of the facts and how your organization performed the previous year, tell stories of impact that illustrate the necessary facts. Humans love stories and if you want people to be impacted by your annual report – or at the very least, read the thing – you should tell captivating stories. In IJM’s annual report, you find numerous stories of beneficiaries that illustrate the organization’s good work. You don’t have to say “our organization is great because we did these things.” Instead, highlight what your organization is doing and then show the read with a great story. This story structure is easy to follow, demonstrates the great work you’re doing, and includes in the donor to see how she could make a difference by partnering with your organization. Your annual report usually has two audiences: existing supporters and potential supporters. You may be unaware of all the uses of your annual report, I recommend speaking with your major donor reps, planned giving folks, customer service team, local community outreach department, board members, executive team, and others to discover how people use the annual report. When we did that, we discovered our major donor reps use the annual report as a general brochure would be typically used and our event organizers take a few to every event to explain how the organization has operated. With these use cases in mind, you should make sure your annual report inspires action and gives people a way to take action. 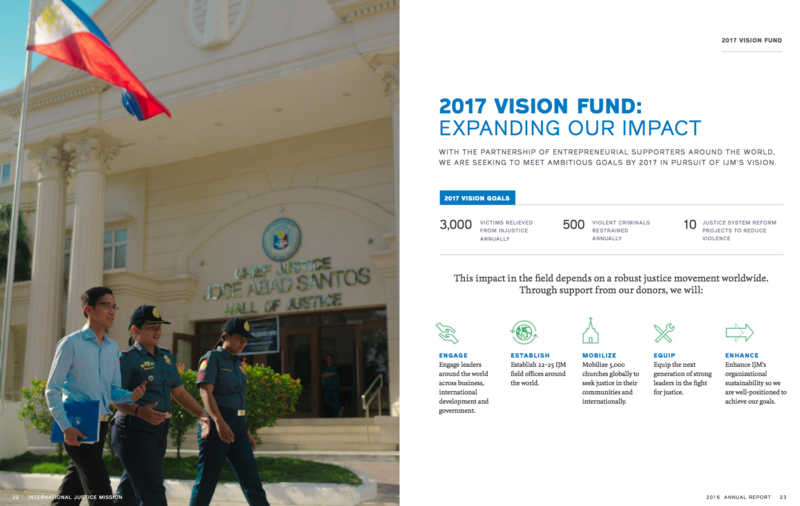 In IJM’s annual report, they review their vision for 2017 and add in specific areas where the reader can help. 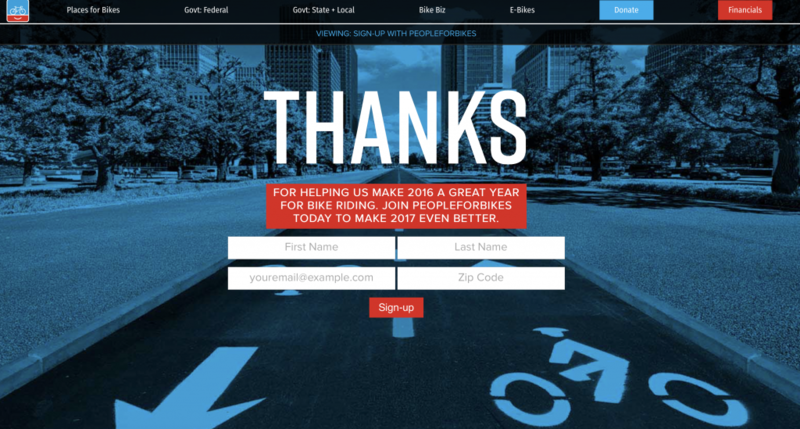 In their annual report, People for Bikes has a subscribe call to action at the end of the annual report to connect with more people. Near the end of the CARE annual report, the organization provides you a number of ways to get involved. By including it at the end, you’re able to best capture those who are interested in reading the entire annual report. CARE does an excellent job of telling stories from the donor’s point of view throughout the piece illustrating the impact the donor is making on the organization’s beneficiaries. To be honest, we’ve struggled with this in the past. With all of the time and resources invested into producing the annual report, doesn’t it make sense to invest in heavy marketing for the piece? If you’re creating a storytelling annual report that inspires people to take action, wouldn’t it make sense to invest equally as much time as it took to produce the annual report into marketing it? Build custom targeted lists in Facebook to advertise the annual report to. These lists could include your donor file, email list, lookalike audiences for each, website visitors, fans of similar nonprofits, or fans of celebrities and influencers engaged with your nonprofit. Create an annual report video to provide highlights of your year. Create Google Grant Adwords to promote the annual report. Use your brand ads to promote the annual report. Engage with bloggers who support your organization to promote the annual report. Post infographics from your annual report to Pinterest and Instagram to reach the visual-loving crowd. Detail financial reporting. You should have some financial information to give the reader a snapshot of your finances, but you can produce the 990, separate financials, or your financial audit to share all the details. Exciting information … only to your staff. You may be thrilled about your new donor management system, the HVAC being replaced, or an exciting new travel policy, but none of them belong in your annual report. If you have news that only thrills your staff, keep it for the employee newsletter. The future. It’s ok for the President or Executive Director to hint at future plans, but don’t dwell on them. The annual report is a look back on the past year, not a look forward to the future. It’s great to include a page of future plans, especially when it comes to motivating donors to action, but positioning the annual report as a look at the future is the wrong goal. Jargon-filled articles. Industry jargon and technical details on your theory of change don’t below in the annual report. Avoid uncommon acronyms or insider language and go for beneficiary stories that tell the impact a donor made on a life. Looking for inspiration? 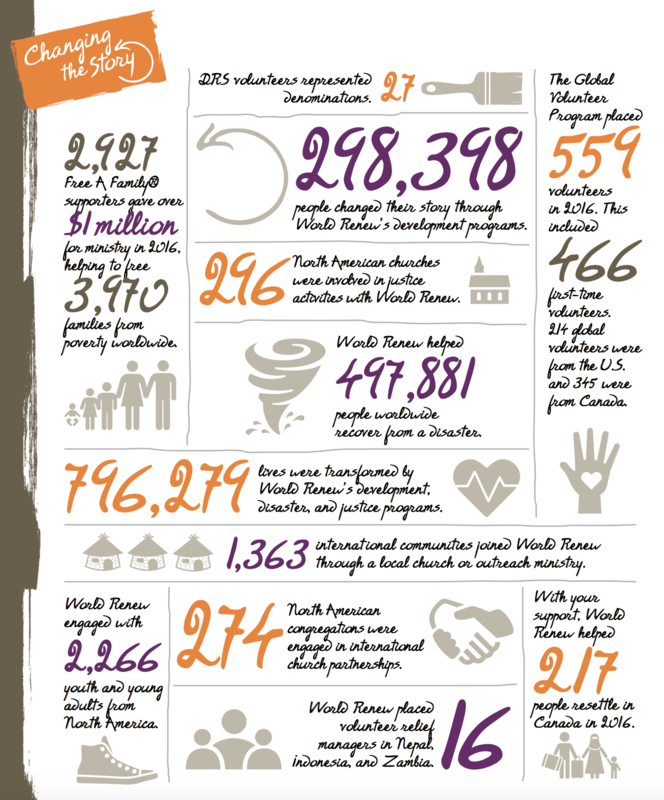 Check out these great annual reports to see how other nonprofit organizations produce their annual reports. Jeremy Reis is the Senior Director of Marketing at Food for the Hungry, an international relief and development organization headquartered in Phoenix, Arizona. Jeremy serves on the Advisory Council for Christian Leadership Alliance, an alliance of more than 6,000 mission-focused Christians who lead in today’s high-impact Christian nonprofit ministries, churches, educational institutions, and businesses. 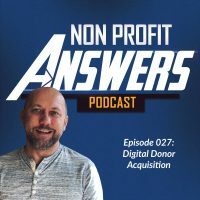 His aim is to help all nonprofits take advantage of technology solutions to improve donor experience and fundraising. For a limited time, download a free copy of my book. We love fellow fundraisers, you can unsubscribe anytime.